Parents are making their lists and checking them twice. 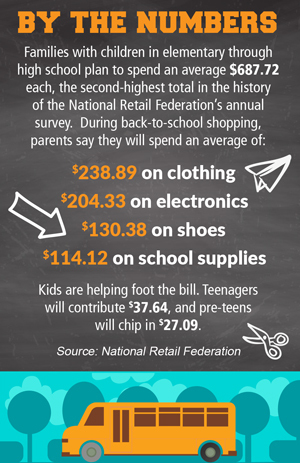 It’s back-to-school shopping season, and families are shelling out more than ever. Families with children in elementary through high school plan to spend an average $687.72 each, the second-highest total in the history of the National Retail Federation’s annual survey. “We live in an instant society and live such busy lives that most people don’t plan ahead, and they wait until the last minute to shop,” says Carrie Crane, a member service representative at Dupaco Community Credit Union’s Manchester, Iowa, branch. But there are ways to save—and even get a head start on planning for next year’s big event. Keep track of school supplies you already own by storing items your kids bring home at the end of the year in a central location. “Then go through that when it’s time to start shopping for supplies for the next year,” Crane says. Crane saves by planning ahead with her two sons’ clothes and shoes. “I look for sales throughout the year and buy ahead,” she says. “If it’s a really good deal, I will buy their next size also and store them.” Back-to-school sales have already started, and Iowa’s annual Sales Tax Holiday, which waives sales tax on select clothing and footwear, is around the corner, Friday-Saturday, Aug. 4-5. Crane also saves money by purchasing used clothes. “I have family and friends who have boys a little bit older than mine, and I purchase their clothes at a very reasonable price,” she says. If you dread the whole shopping experience, buy supplies through your school next time. The purchasing deadline is usually in the spring. “There are so many choices when buying school supplies, so by doing this you make sure you are getting the right supplies and save money,” Crane says. Save year-round too. Don’t let the back-to-school expenses sneak up on you. Take advantage of Dupaco’s You Name It Savings accounts to systematically save from your payroll or checking account. “You can have as little as $5 a pay period automatically put in your Back to School Account,” Crane says.